A real woman is a lady. A real woman is confident, yet humble. A real woman is honest. A real woman will not tempt a man. A real woman will save herself only for her husband. A real woman will love her husband for all he is - his flaws, his talents, his shortcomings and his successes. A real woman will respect men. A real woman will be patient. A real woman has a gentle and quiet spirit. A real woman is selfless. A real woman has a good sense of humor but knows when to be serious. A real woman is modest - not only in her clothing, but in her manner. But above all, a real woman loves the LORD with all her heart, mind, and strength. She loves Him more than she loves her man. And dedicates her life to living for Him and pushing her husband closer to their Savior. Men, if the woman you like, have a crush on, or are currently dating, is not striving to match these should-be-requirements-for-every-possible-interest, I can promise you that God has someone else much better out there for you. A real woman who has your best interests at heart. A real woman who puts God first and you second. A real woman who loves you with the kind of love that only comes from above. This woman you write of - I want to meet her. I could learn a bit from her - but the last thing I'd learn is to be REAL. I once used to be so fascinated with the ideal, and the perfect, and the beautiful, and the proper that I lost sight of REAL. 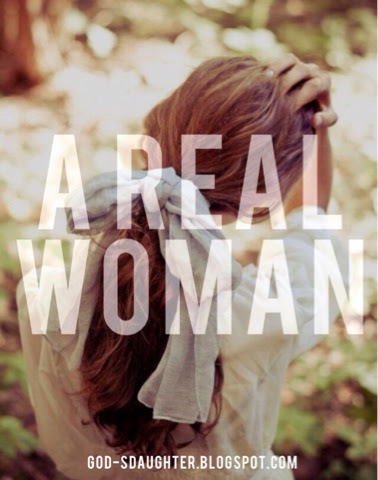 a REAL woman is exactly that - real. she is flawed, she is broken. most likely her tongue runs ahead of her brain. and a list even longer of insecurities. she is God's, and God is hers. She rise and fall, she will hurt and heal, she will bruise and bless. And a REAL woman will keep her eyes on Jesus to fill her every void. Your list is right and true, but the only list that a REAL woman can live up to is the one that says - I believe, I love and I trust my God. And my life is made new by Him. Its not about ticking boxes - its living a live renewed. With love from your sister in Christ. Amen. Beautiful post - so, so true. Tis remarkable to see such wisdom in our Youth today. I am pleased to have read this, and thank you for sharing these words with the general public. I sincerely hope that this touches peoples hearts in a way that would make men strive to be worthy of such a prized treasure, and that women might readdress the values of modern society and take a much higher and more successful road. Such a beautiful post!!! Have you by any chance read the book Let Me be a Woman by Elisabeth Elliot? Thank you! And yes, I have. Hey Raquel, I really love this! But I would like to add my view / maybe clarify on you're last comment of the post. l think that because a girl is not -this- woman isn't the point, its that she is *striving* to be. In which case a man should ask himself, is she trying to be this woman? Do I see growth in her relationship with God? And if she is, then she will become more and more like -this- woman, the woman God wants us all to be.